The moratorium was followed by the set up of turtle monitors network or “the Dau ni Vonu (DnV)” in 2010 that has been instrumental in the support of the growth of sea turtle population in Fiji, and has been successful in roping in turtle hunters, who have made a change for conservation. The ‘No Take’ policy on harvesting of vulnerable and endangered species of sea turtles still exists.This is after the Ministry of Fisheries issued a notice that a “ban on the harvest, sale, possession and transport of sea turtles, their eggs or any part or product of a sea turtle still exists”. 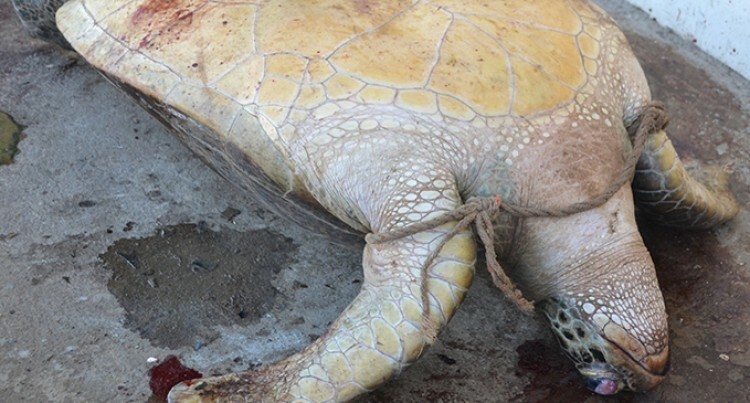 It is just a continuation from “The Turtle Moratorium from 2009 to 2018 that ban the harvest of turtles or their eggs”. Sea turtles spend most of their day feeding or sleeping under reef ledges or in the open ocean. Some travel hundreds or thousands of miles to feed or nest. Females lay their eggs on sandy beaches and are slow and awkward on land. A female will usually lay several nests during one season and may nest every two to three years. From September until February every year, these sea turtles have their nesting period and members of the public are to “be mindful of the current policy to protect sea turtles across Fiji waters”. The moratorium prohibits any form of capturing, killing, handling or molesting of turtles. Coastal communities have been asked to be vigilant as the turtles may come on their beach to nest. Currently there are 80 DnV in 20 sites around Fiji. All species of sea turtle are listed as Threatened or Endangered on the International Union for Conservation of Nature (IUCN) Red List. As a delicacy, sea turtles have been consumed throughout history in the islands of Fiji. They are of immeasurable worth as a cultural asset which is a central element in Fiji’s respective customs and beliefs. In the example of a chiefly function, local fishermen are required to present turtles to their chief – it is their obligation as demanded by an age-old tradition. While over the years, thousands of sea turtles have been slaughtered in the name of tradition, today, things are changing. Now it is time that we all join in the fight to save the turtles. Let us respect the moratorium. largely because of changes brought about by humans. We must ensure that during their nesting season they are not disturbed and are safeguarded. Let us observe and comply with the current ban on harvesting turtles. We must save the turtles.